According to information from Athens Indymedia, comrade Konstantinos Giagtozglou will end his hunger and thirst strike after the Prison Transfer Committee met today on Friday, March 2nd and accepted his demand for transfer to Korydallos Prison, which will be made effective on April 10th. Originally published by Insurrection News. The comrade who is accused of belonging to the Conspiracy of Cells of Fire and sending explosive packages to European institutions and to the former Greek Prime Minister was on hunger strike from February 21st and on thirst strike since February 25th demanding his permanent transfer to Korydallos Prison so he could be near his family and friends. 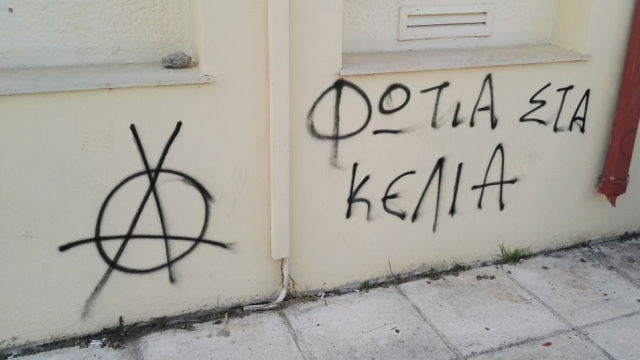 There is no doubt that the offensive actions of solidarity carried out by comrades in Greece both inside and outside the prisons was an element of important pressure for the decision that was finally made in Dinos’ favour. We will share more information as new updates are disseminated about the case. We send greetings to the comrade and to all those who showed forms of solidarity and did not remain indifferent to the comrade’s hunger strike. Sin Banderas Ni Fronteras, cell of anti-authoritarian agitation.